My daughter took this picture early this morning. My mom said it looked like a rainforest outside today. It has been so humid you can almost see the heaviness in the air and definitely feel it, between the rain. It will disappear and our dry summer heat will be here soon. Such tangible references help me understand God's Word. 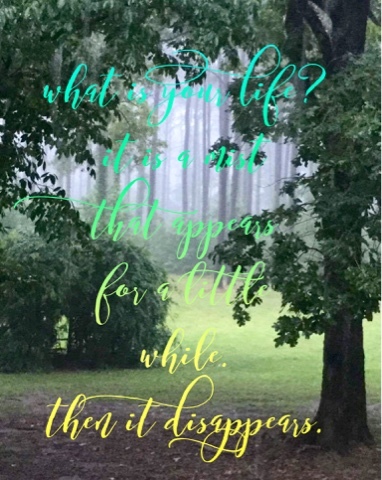 Mist that disappears compared to our life. It is passing so quickly. As a parent, watching my children grow is just one clear example of that. And through it all, I do need to always ask: "if it pleases the Lord." What a great photo, and agree, it fits your scripture post. Looks like you could step into that photo and explore. Really like how the tree frames it. Have a great Sunday. 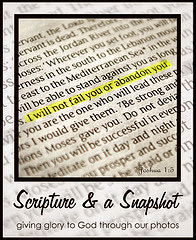 Your daughter took a great image and the scripture so fits the image. Wonderful photo. It is so true ... we don't even know what will happen tomorrow. And yet, we waste so much time and energy on the "what if's" which never be. Grateful for the reminder that all things are as "the Lord wills". Blessings! Life really is very fleeting. Thank God that this life is not all that there is! I love this photo and the Scripture. I know a Christian school teacher who assigned this memory verse to his class the week he suddenly and unexpectedly went to heaven. Best lesson they ever had, and I'm sure none of them have ever forgotten this verse.